Thus far, April has been a pretty rainy month. As to be expected considering the phrase “April showers bring May flowers.” Despite that optimism sometimes it is challenging to get excited about leaving the house when it’s rainy especially if you’d rather make it to your car or class dry. 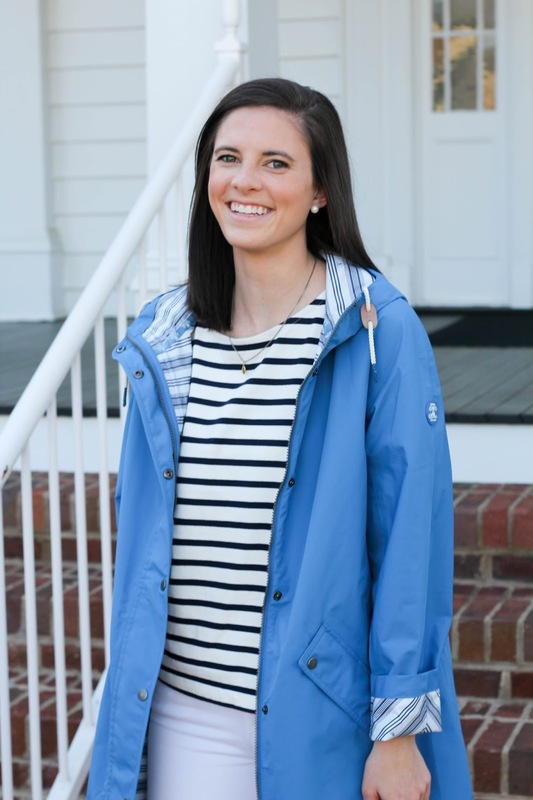 With that being said, I am so excited to have a new rain jacket that is fashionable and functional for those rainy spring days we are sure to have. This particular raincoat is one I know will hold up for many rainy seasons to come since it is from one of my favorite brands, Barbour. 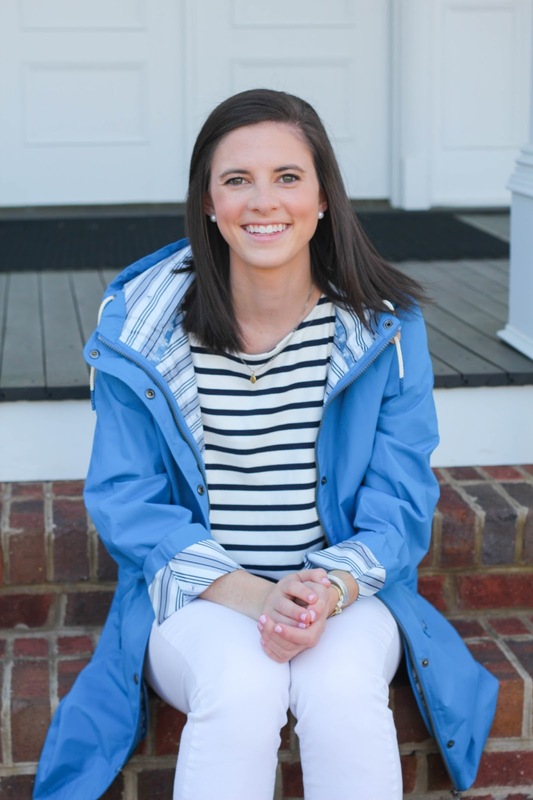 My Barbour Beadnell jacket (which y’all have seen in a number of different blog posts) is without a doubt one of the most worn pieces in my closet and one of the best gifts I’ve ever received. It has been worn so much the past 3 years I’ve had it that I need to remember to get it rewaxed this summer to prepare it for years to come. While Barbour is well known for the classic waxed style as well as their quilted jacket I have found myself LOVING all of their new spring pieces since they are practical without lacking style. 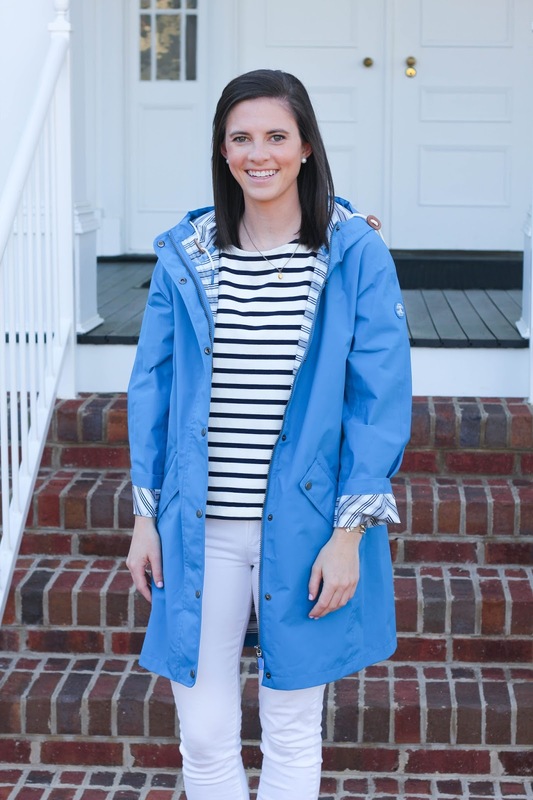 This bright blue Barbour Pegmatitte Jacket is waterproof with a longer length and a flattering shape. It is a single layer making it lightweight which is great since it can get pretty warm in the spring and summer in the south. One of my favorite parts of this jacket is the striped interior. The hood has small navy and white stripes and the same pattern is present when you roll up the sleeves! 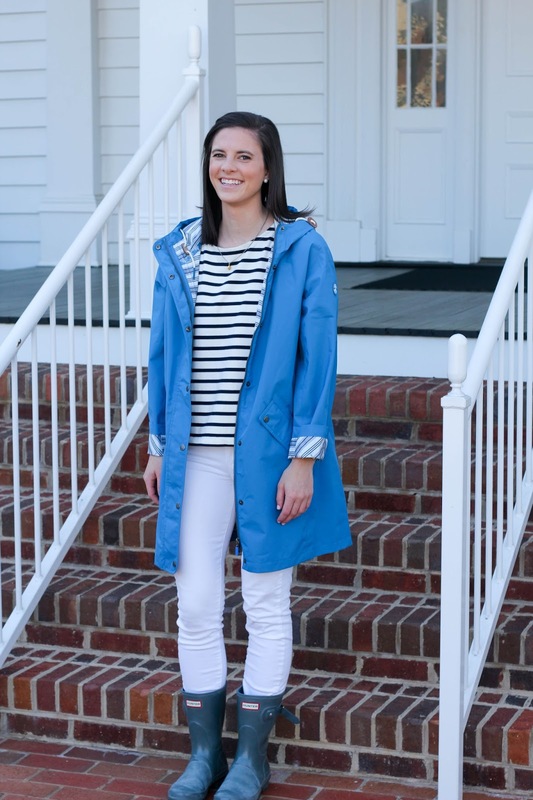 With the bright color and practical style I am sure that rainy days won’t be something to dread if I am wearing this. Dare I say that rainy days may even be something to look forward? 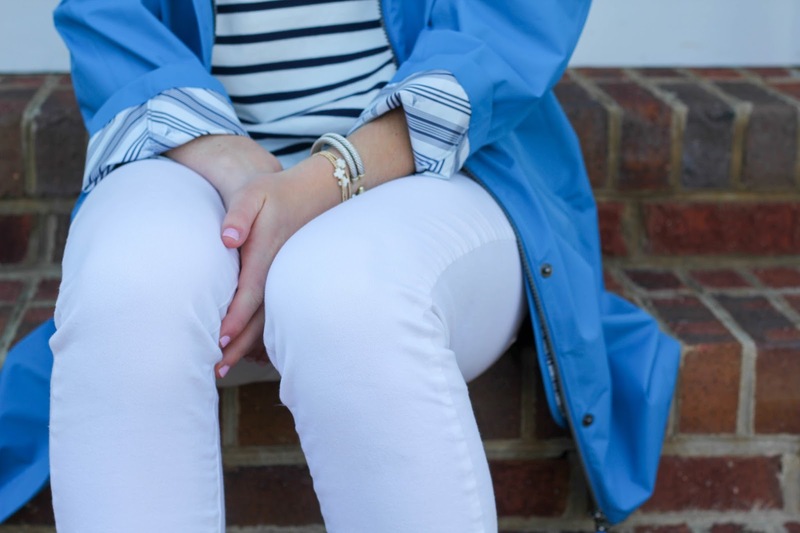 If I were a rule follower in the fashion sense, I would say it is still a little early for white jeans but I am ready to stop reaching for darker colors and instead start gravitating towards my brighter ones. The good thing about this jacket is that it looks adorable with both! 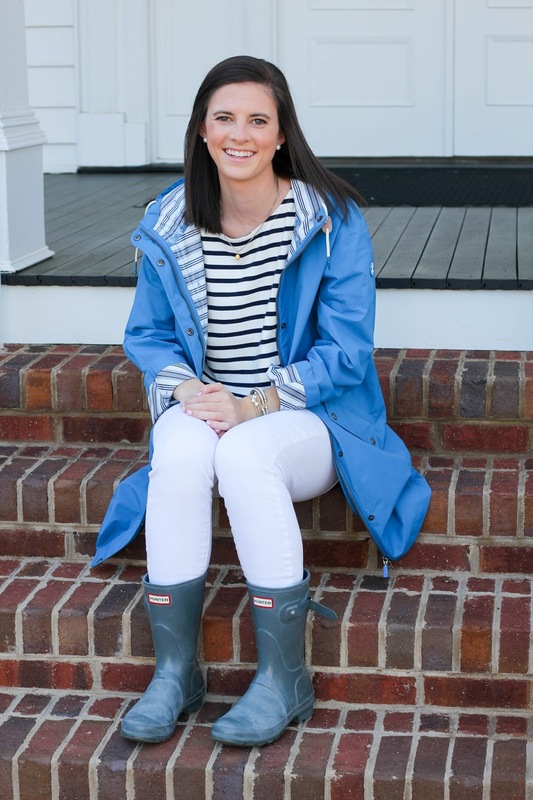 Hunter rainboots have been my go-to on rainy days for years and pair perfectly with this jacket. I have both a tall and short pair and have been gravitating towards my short pair more and more as of late. That may be due to the fact that they are newer and are grey instead of the magenta color that my tall ones are and I always opt for high-gloss in Hunter’s since I prefer that look over the matte style. Now, all you need is an umbrella and you are set for any rainy day that comes your way! 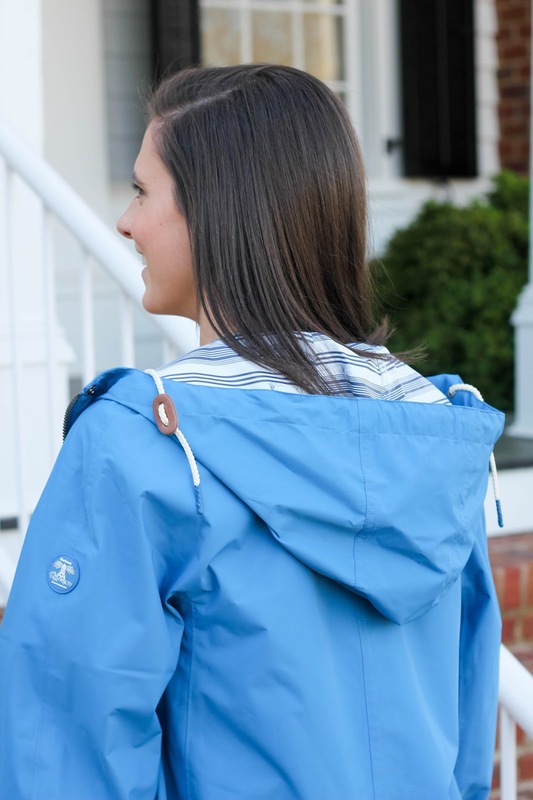 Hoping the forecast is looking dry your way although with this jacket I am a bit excited for some more rain! This rain jacket is so amazing I love the color of it! Ah this jacket is gorgeous! I want one! 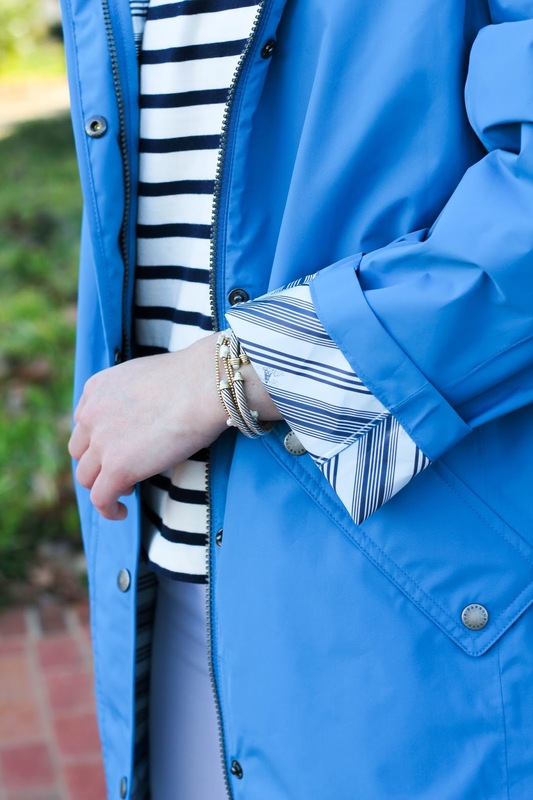 Love the color of your Barbour- it's so cute for spring!